Lee Hayden of PGR Timber and Paul Taylor of Filplastic. Leading UK racking specialist Filplastic has completed a contract to help PGR Timber launch a new flagship depot. The depot, in Brentwood, Essex, consists of a trade counter and shop, warehouse and timber yard, and is situated on Hubert Road in the town. Filplastic, which is based in Eastrington, East Yorkshire, supplied shelving and baskets for the shop, A-frame racking for the warehouse and pallet and cantilever racking for the timber yard, in a contract worth around £70,000. The new depot is the sixth in PGR Timber’s network, which includes Egham in Surrey, Romford, Harold Hill, Basildon and Rayleigh, all in Essex. PGR Timber’s managing director, Phil Kruse, described the Brentwood depot as ‘very impressive’, thanks in part to Filplastic’s design and installation work. It is the third time the two companies have worked together, with Filplastic supplying racking to PGR Timber’s depots in Egham and Romford. We chose to work with Filplastic for a third time because the company ticks so many of our boxes. Their experience in the builders’ merchant sector means they buy into our vision of how we want our depots to look and function, and help us turn that into a reality. It is not just in the products that they supply that Filplastic brings value. They have a comprehensive design service which enabled us to make the most of the space we had available and create something which gives our customers an efficient and enjoyable purchasing experience. We’re extremely pleased with how the new depot has turned out, and Filplastic has played a big part in that. Work started on the Brentwood depot in October and was completed in January. The branch opened to trade and retail customers earlier this month. Graham Matthews, of Filplastic, said the Yorkshire business was delighted to have worked with PGR Timber again as the two companies had built up a great, ongoing relationship. 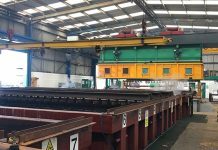 PGR Timber is a well-run and very ambitious company that is really well known in its heartland of Essex. We won this work through a tendering process and were extremely pleased to have been appointed because, having worked for the company before, we knew it be a great project to be involved in. The finished depot is fantastic and gives tradespeople and DIYers in Brentwood a greater choice of where to buy their building supplies.